Daryl Johnson (Worcester Park, United Kingdom) on 13 December 2008 in Documentary & Street and Portfolio. 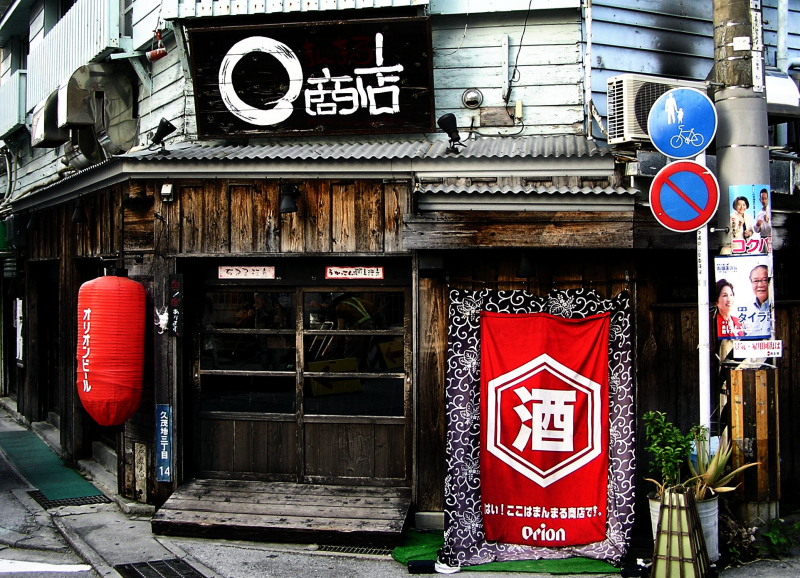 Cool little izakaya I saw on the street while wandering around near Kokusadori, Naha. Didn't get to try it unfortunately. Nice shot. That bright red really pops. Wow, I would love to have tried that restaurant; very nice colours! @Lorraine: Cheers Lorraine! Yes, I'd love to go back... there are so many interesting restaurants in Japan, and despite my best efforts, only so much room in my belly (although I'm working on increasing this, year by year). great colours, very interesting image. what is that blue sign with a red slash thru it?? @Cheryl: I think it's 'no parking' Cheryl. Thanks! No parking for the cars! Children and bicycles coming through! I love the wooden door! Striking bright colors, especially the reds. Interesting shot Daryl, lot's going on in the frame, good shot. I love all the colors, specially the wood surrounded by flashy red and blue. Nice! Looks like a good place for a bite, and I enjoy the strong contrast in this photo very much.